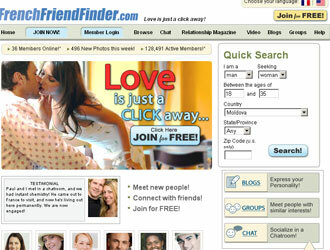 FrenchFriendFinder.com is a site aimed for people who are looking for love, the slogan of this site is “Love is just a click away…” there are already more than 150 thousands of active members on this site. FrenchFriendFinder.com is a place where people from all over the world are finding each other. And there are a lot of stories with happy ends placed on the pages of this site. While becoming a member of FrenchFriendFinder.com completely free you are able to meet some new people, to connect with friends, find romantic partners and soul mates. The premium members also get a top of each lists of members, unlimited number of contacts, advanced searchers and as a result more responses. Also this site is giving a chance to the webmasters to earn some money while bringing some more members to the site. Join FrencFriendFinder.com for free now. The service is interesting enough if you are into French singles. Interesting features are available only after the registration. They allow flirting, talking through video chat and even sending gifts. After small conversations with few members I suspect that there are few phony profiles implemented in the service. I want to see the reaction of the scam protection service after I deliver information about those profiles to them.